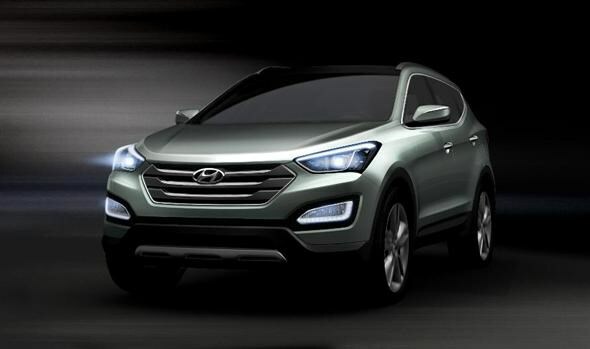 Hyundai has released the first images of its new Santa Fe 4x4. The third generation of the firm’s five- or seven-seat SUV promises “refinement, smartness and practicality” if you listen to the PR blurb. Hyundai isn’t telling us a huge amount more at this time, choosing to keep us guessing until the car’s official unveiling at the New York International Auto Show in early April. Working on what we know about the previous model, however, buyers should expect a range of smooth diesel engines with adequate punch. The ride is likely to be fairly smooth, and you can expect some off-road capability too. One of the last model’s main attributes was the large amount of interior space on offer, both for occupants and in the boot. In fact, the boot was bigger than a Range Rover’s. It’s also likely you’ll get loads of standard kit, since Hyundai prides itself on offering significantly better value for money than many of its competitors. There will probably be a Blue Drive option promising low CO2 and high MPG, which should make the Santa Fe attractive to those looking for low running costs - such as company car drivers. Another thing that’s worth considering is Hyundai’s five-year Triple Care assurance package, which takes a lot of the stress out of owning a new car. Hyundai has come on leaps and bounds over recent years, and the firm is rapidly building a reputation for well-built cars that are highly efficient and good to drive. There’s no reason to expect the new Santa Fe will be any different. No release date or pricing details have yet been confirmed for the new model, but with the existing Santa Fe costing upwards of £23,745, buyers should expect the new model to cost in the region of £25,000.